If you are struggling with writing songs due to lack of music theory knowledge, or if you just keep using the same chords over and over, this app may help. When I’d play guitar, I tended to use the same common chord progression of G-C-D over and over. And on piano, I’d tend to play C-F-G. I really didn’t want to keep referencing a chord progression chart. 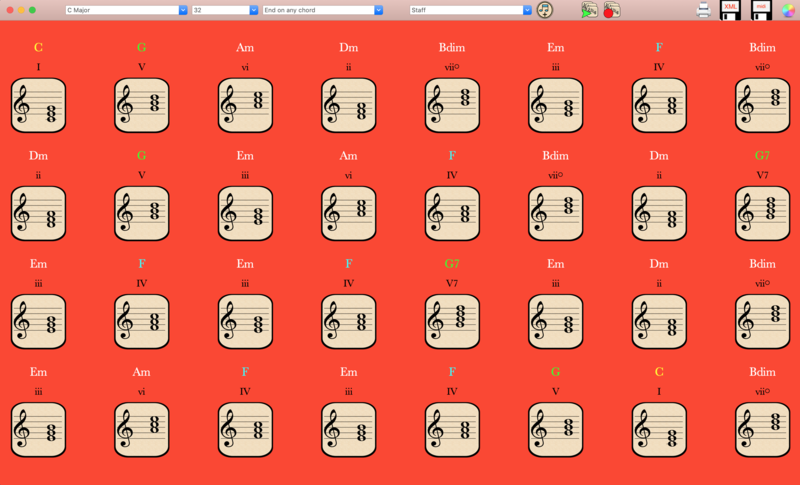 What I needed was an app that was a chord progression generator. I couldn’t find a decent one, so I decided to write one myself. (It’s called Songwriting Inspiration on the Mac and Songwriter’s Inspiration on the iPhone and iPad. )The first thing I needed to do was figure out what chords in general sound good following one another. Wouldn’t it be cool to pick the key I want, and have it spit out a random progression. But not just random progressions, random good chord progressions! And wouldn’t it also be cool to pick how many chords I wanted. It might be fun to have it suggest 32 chords, and just play them like a freeform jazz thing. But if I wanted to do a more traditional hit type song, I probably only want 4 chords. Once I figured that out, I realized, wouldn’t it be better to not only pick the key, but pick how I want it to end. Sometimes you might want it to end on a IV, for say a verse, but end on a V for chorus. Cool, the app was working well. But I wanted more than just major and minor keys. Wouldn’t it be cool if I could do this for all modes. So pick E Dorian, 8 chords, and have it end on a tonic. Sweet! But then I have friends that play guitar, and they can read tablature, but not traditional staff music notation. So wouldn’t it also be cool to not just have the chords in music notation, but guitar chord charts? And I’m not super strong on keyboard, so what if I also did some piano chord charts. Surely there’s lots of people out there writing hip-hop that can’t play piano (I’ve seen lots of them on YouTube, and have seen them complaining in the forums) and they could benefit from this too. Also, wouldn’t it be good to have some pre-canned progressions? I play blues guitar, it’d be nice to have a chord progression generator for the 12-bar blues in any key. I play a little jazz too, it’d be nice to spit out the standard jazz progression. There’s also a handful of common pop rock chord progressions. This would be great if I wanted to go back and do a 60s pop rock type song. It’d be nice to print out the chords too, so a music teacher could share ideas with a student, or it could be shared with band members. But I use Logic Pro X. What would really be nice is if I could import the chords into Logic, and that’d save me a ton of time. Logic Pro supports MusicXML, so it exports the chords, but also takes the root note, and exports that as a second track for bass. But not everyone uses Logic, so I had it output in MIDI, so that any DAW could import it. Honestly, this app is more than just a chord progression generator. I think this app should be worth $100. I can pick a key, have it generate a decent sounding progression, import it into Logic X, pick a patch that I like for chords. Pick a patch that I like for the bass track. Within minutes I have the main part of a song. I can quickly add in either Apple Drummer, drum loops, or my own drum programming, and I’m rocking out to my new creation in record time. If I want to vary it up a bit, I can go back into the app and generate another progression in the same key, and then import into Logic. I now have a Part A and a Part B, or a Verse and a Chorus. If I want a melody, but have no idea how to write one. I could use the chords with an arpeggiator, and voila, done. I’ve released 3 albums in 3 different genres (Jazz, Hip-Hop, and EDM) and used this for probably 80% of the song creation. I’ve also used it to write a bunch of Chillwave and Classic Rock songs. Sometimes it feels like I’m cheating because it’s so easy! Also check out Key Signature Flashcards if you are looking to site read key signatures on the staff.